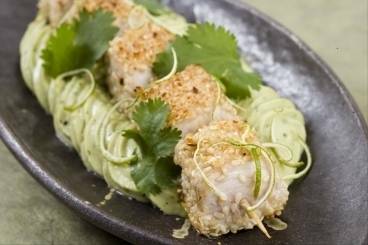 Skewers of marinated tuna rolled in sesame seeds served with avocado purée. Skewers of fresh tuna 'cooked' in a lime and soy sauce marinade, rolled in toasted sesame seeds and served with an avocado, red onion and chilli salsa. 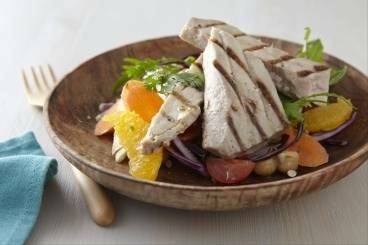 Char-grilled tuna steak served with a salad of red cabbage, fennel, orange segments and chick peas and a spiced vinaigrette. 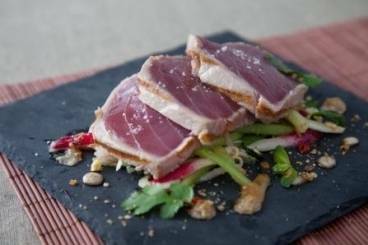 Rare grilled tuna loin on a bed of fennel,cucumber and radishes served with a fragrant thai dressing. 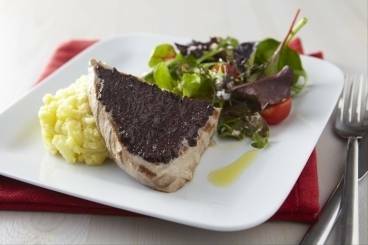 Tuna steaks with a lightly cooked slice of foie gras served on a bed of baby spinach leaves with a beetroot drizzle. Easy to prepare tuna and salmon skewers served with rocket, avocado and lime dressing. A traditional sushi roll made with fresh tuna, with a spicy kick!